Finally it's time to show off the retirement gift quilt that I made a few weeks ago at the request of a friend who works for the lady who is retiring! 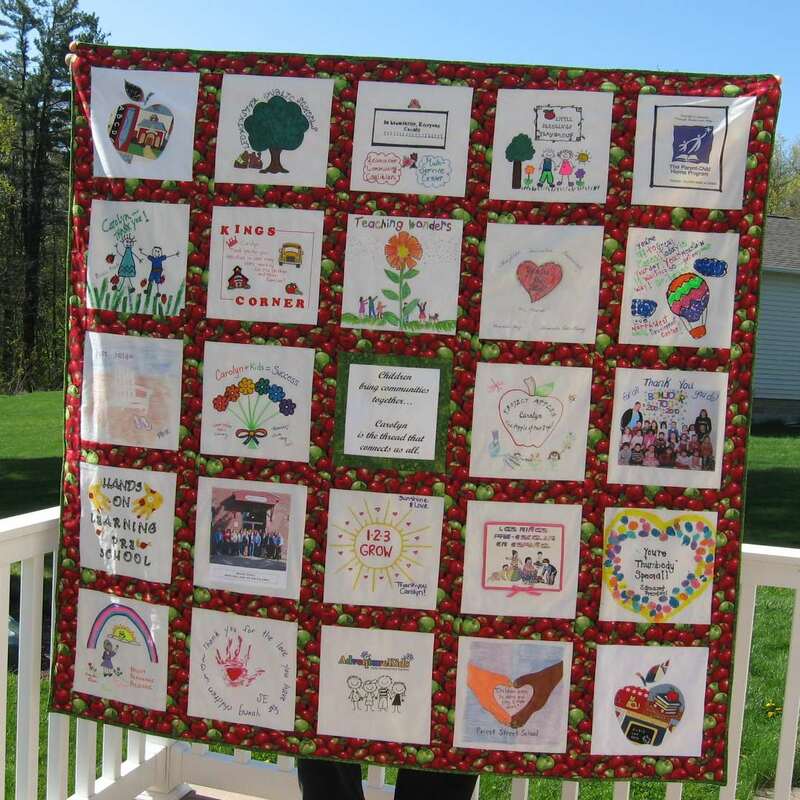 Lisa, my friend, had been seeing some of my handiwork on my Facebook page so she contacted me and asked if I might be able to make this quilt that she had in mind for her boss, Carolyn, who would be retiring soon. This was in early April that we had our conversation, and the retirement party was May 6th. No pressure! Everything worked together nicely to get this quilt done well before the deadline. Lisa knew exactly what she wanted and was able to convey that to me, my son's school had a week of vacation in April during which he was sick just about the whole time. Not awful sick, just fever and laying around not wanting to do anything sick. This gave me a whole week of not having to run out in the morning and again in the afternoon and sometimes in between, but unfortunately for the kids also no chance of having play dates with friends or going to the park or much fun for the week. 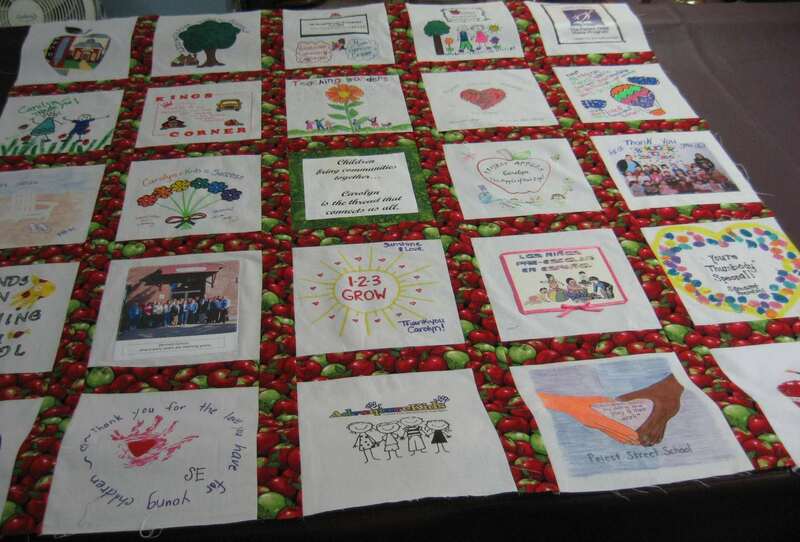 Anyway, I was happy to have the time to sew on such a nice project, filled with so much love for Carolyn and all the work she has done in this city for so long. A trip to Appleberry Fabrics was my first stop on this journey. 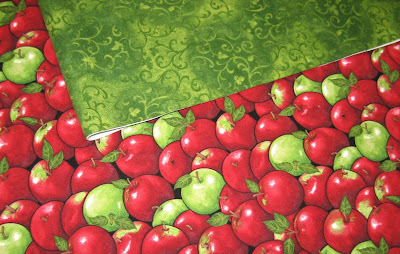 Robin had just the perfect fabric for this quilt - apples! 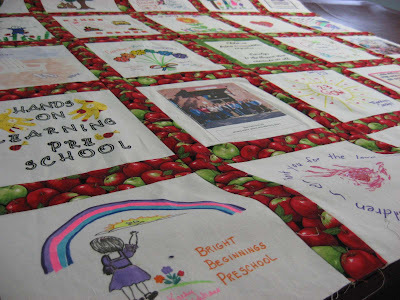 One of Carolyn's early childhood programs is called Project Apples, which is the program Lisa works with, so Lisa wanted apples as the theme for the quilt. This fabric fit the bill perfectly! 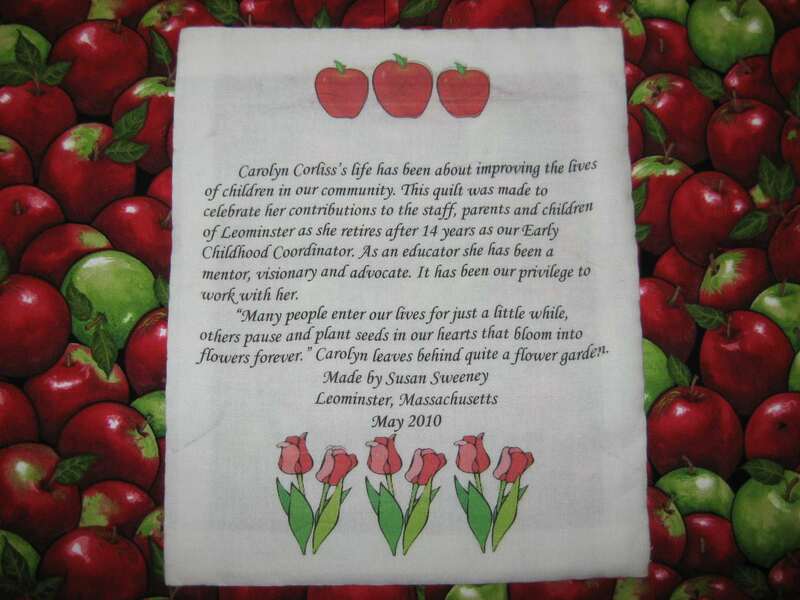 Also our wonderful city of Leominster is world famous for being the birthplace of the one and only Johnny Appleseed, so apples are a common theme for all sorts of events and businesses around here. I also purchased a nice soft white Moda broadcloth and cut it into 10 inch squares which Lisa distributed to all the programs. 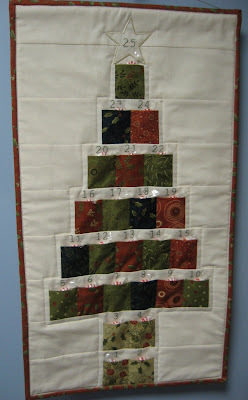 Each one decorated a block for the quilt and Lisa returned 23 finished blocks to me within a week's time. 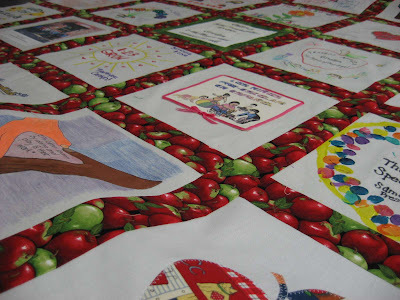 Two more blocks were needed to fill the empty spaces, so I cut out an apple shape from some leftover fabric I had in the perfect theme, appliquéd it onto the blocks and put them in two opposite corners of the quilt. You might remember this fabric from an art smock I made for my son. I also used it many years ago to make a dress for my older daughter who is in now college back when she was about my son's age - 7 years old! So that fabric has been around a long time and has served its purpose very well over the years! Then I laid out all the blocks and moved them around until I was happy with the arrangement. The short pieces of sashing were sewn between the blocks to make columns. Then the long pieces of sashing were sewn between the columns to bring all the blocks together. 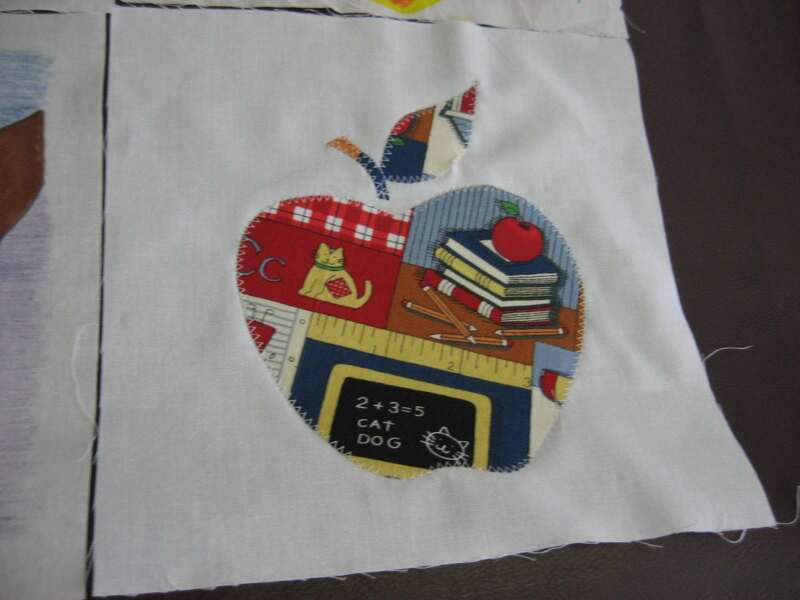 The design on the apple fabric is a one-way design, so in order to keep all the apples going in the right direction, I had to cut the vertical strips long instead of the horizontal strips, which would have required piecing. 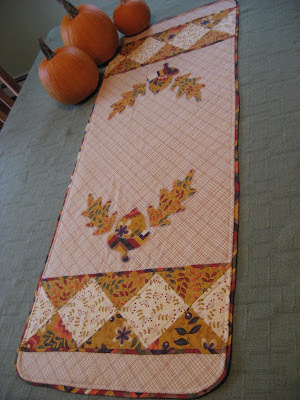 It's such a busy pattern and the sashing is only 2 inches wide, so most people probably would not have noticed some apples going in a different direction, but I would have known. That sort of thing bothers me, so horizontal short pieces and vertical long pieces of sashing solved that problem. Each of the blocks was unique. Some were hand painted. Some were pictures printed onto the fabric. 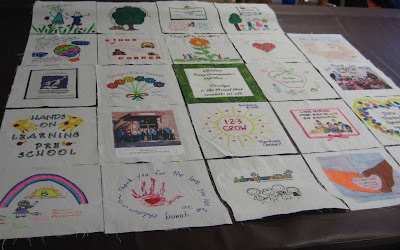 Some had appliqué designs on them. Some were done with fingerprints in fabric paint. Each of the blocks reflected the group it represented. Some were simple shapes. Some were intricate reproductions of pictures out of a children's story book. The center block, framed in the same green as the border, says "Children bring communities together...Carolyn is the thread that connects us all." And here it is, all bound and finished. I love how the blocks appear to be sitting on a big pile of apples! The holder of the quilt is my husband, the only person in the house whose wing span was big enough to hold it out straight and off the ground! It ended up measuring 60 inches square. A few of the blocks had apple shaped buttons attached to them when I received the blocks, but I had to remove them to piece the quilt. The picture above was taken before I sewed the buttons back onto the appropriate blocks. I just had to take advantage of the beautiful picture taking weather! This label was printed and hand stitched to the back. I love how the red apples and the red tulips add such nice color to the white label. 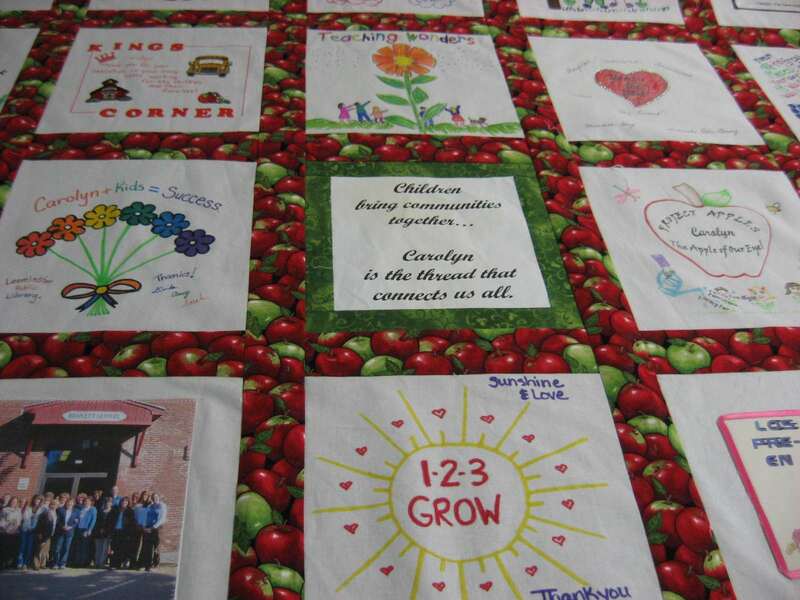 I heard from Lisa that the retirement party for Carolyn was a great success and the quilt was very well received. 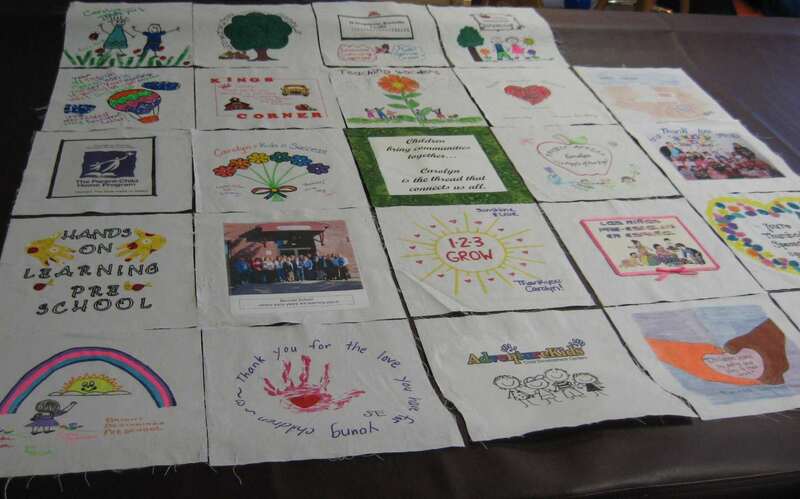 It will be a wonderful remembrance of all the people and programs she worked with over the years, and all the children's lives that she influenced. Oh Mary Grace - it turned out wonderfully! 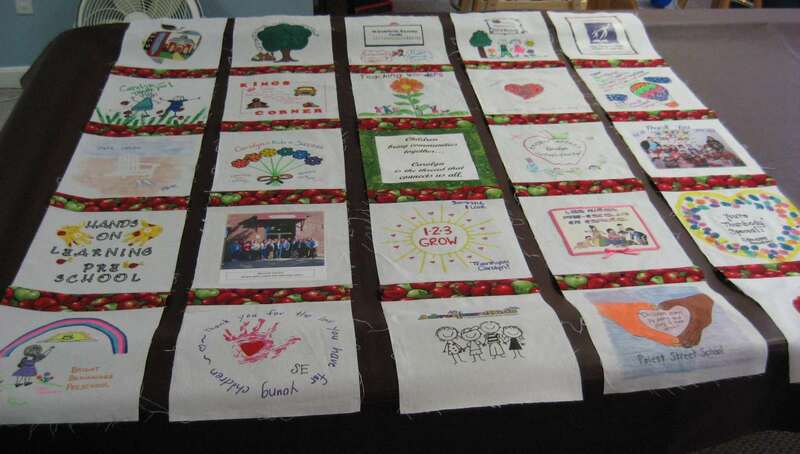 What a perfect present - I'm sure it will be treasured forever - great job!! 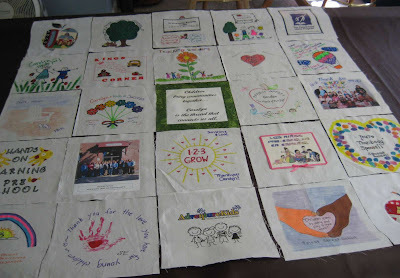 Wonderful quilt, and truly gifted ways of creating blocks to complete the quilt. Beautiful! I'm sure it brought many joyful tears..
What an amazing gift for someone who obviously means a lot to those she worked with. Nicely done! 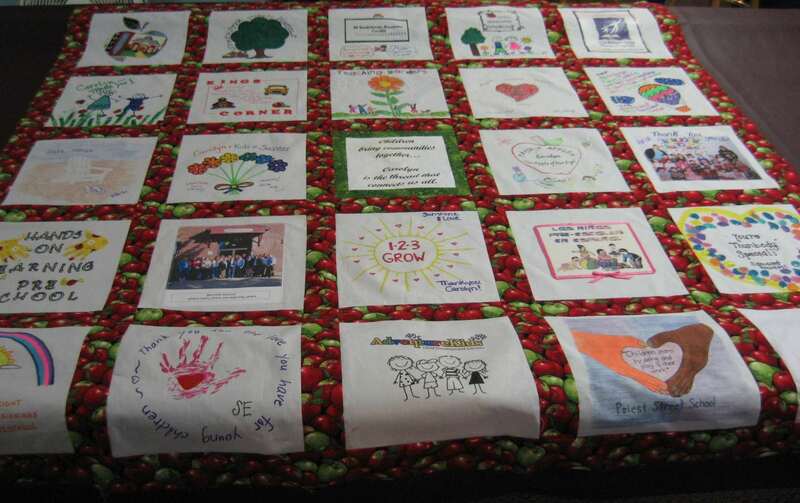 Thank you, Mary, for making my wonderful quilt a reality. Your work is beautiful and will be treasured always.